Diplomacy • State Department says the ambassador was just visiting a popular shopping district. U.S. 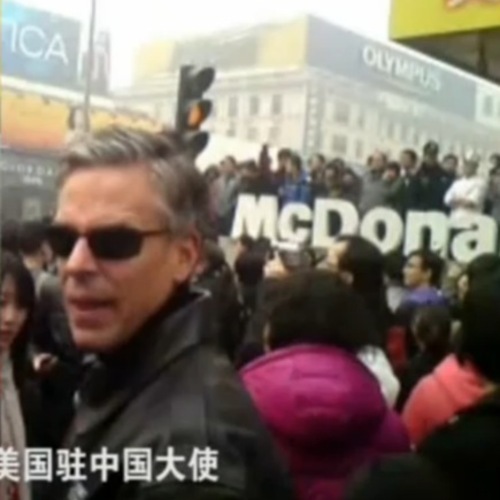 Ambassador to China Jon Huntsman Jr. was captured on video at a protest rally in Beijing. Washington • U.S. ambassador to China Jon Huntsman Jr. was captured on video at a protest rally in Beijing, fueling speculation that the United States was siding with the pro-democracy effort. But the State Department quickly tried to tamp down the story, noting that Huntsman, Utah's former governor, was merely walking through the popular shopping area. Video shot by an unnamed person shows Huntsman and a glimpse of his wife, Mary Kaye, at a crowded rally in a shopping district near Tiananmen Square. Huntsman, wearing what appears to be a leather jacket with an American flag patch on his shoulder, is shown standing outside a McDonald's in Beijing. "Excuse me, ambassador, what are you doing here," the cameraman asks, according to a translation posted on a YouTube video of the incident. "I'm just here to look around," Huntsman responds. "So you want China in chaos, don't you?" the man suggests. "Nah," Huntsman appears to say. "You guys don't know me. Really?" The former Utah governor then offers what appears to be an annoyed glance and charges off away from the camera. Huntsman, who has resigned his ambassadorship effective April 30 and is weighing a presidential bid, was not part of the rally and was simply playing tourist, according to a State Department official who spoke about the incident on condition of anonymity. "The ambassador and his family went on an outing on Sunday, visiting sites including the Wangfujing shopping district," the official said. "The events in Wangfujing that transpired on Sunday afternoon and the Huntsman family being near the area were purely coincidental." The Chinese government, according to media reports, has blocked searches for Huntsman on social-media sites after the incident. The video of the appearance appears to be posted by opponents of a democracy movement, suggesting in the final seconds of the clip that they don't want China to be in chaos such as Egypt or Iraq.